Candy King by DripMore is back at it again with mouth watering flavors but now, they are for your pod systems. Candy King On Salt vape juices bring a whole new level of flavor to low voltage salt pod users and are not meant to be used to sub-ohm devices. Enjoy your favorite candy treats with no guilt whatsoever. Batch brings you an abundance of flavors that are just waiting for you to indulge on them. The taste of sour and sweet gummy candy will surely become your new favorite thing to past your time with. The taste of sour and sweet lime, orange, lemon, and cherry. As you inhale Batch On Salt, these sour candy flavors flood your taste buds sending them on a roller coaster of flavors one right after another. As you exhale, the familiar sweet candy flavor washes away the sourness leaves your taste buds craving more. Who doesn't love the mix between sweet and sour? Sending your taste buds on a whirl wind of flavors, Peachy Rings On Salt will put a smile on your face. On the inhale of Peachy Rings On Salt, your taste buds are going to be shocked with the authentic tangy peach candy flavor. This flavor will send your sweet tooth packing in an instant. As you exhale, the sweet candy flavor washes away the sourness, leaving your palate clean and ready for your next puff time and time again. Strawberry Watermelon Bubblegum is the perfect fusion between sweet and candy bringing the taste of freshly picked strawberries and juicy watermelon mixing it on a bubblegum base. On the inhale of Strawberry Watermelon On Salt, the taste of strawberries and watermelon tango across your taste buds awakening them in the most delightful way. As you exhale, the sweet bubblegum taste combines with the strawberries and watermelon, quenching your sweet tooth in a matter of seconds. Strawberry Belts brings you on a expedition around the world of strawberry flavors. This vape juice provides such an accurate taste of strawberry candy that you won't be able to put it down. On the inhale of Belts Strawberry your taste buds will tingle, your mouth will water, and shivers will run down your spine. On the exhale, the taste of perfectly ripened strawberries and sweet candy mix together to create a sweet treat that will send you into sweet bliss. Sour Worms are everyone's favorite gas station treat. The mix between sour sugar and sweetness is what has your lips puckering and your mouth salivating. No other candy will have your taste buds going hay wire. As you inhale Sour Worms Salt, it will send you diving head first into a bag of gummy worms that have just the right amount of sourness. As you exhale, the sweetness takes over smothering the sourness in an instant, leaving you craving more. Swedish Fish contains the sweetest flavor that you are able to find in a candy and Candy King Salts have lived up to this name and these flavors will bring you to the end of the flavor spectrum. As you inhale Swedish On Salt, the unique fruity flavors will have your taste buds tingling. As you exhale, the gummy candy flavor washes away all of the fruitiness leaving behind only sweetness that will keep you going for days on end. Prepare your taste buds for the best sour candy flavor you've ever tasted. Lemon Drops is sure to have your lips puckering, eyes watering and taste buds tingling. As you inhale Lemon Drops On Salt, the sugary sour lemon candy flavor will have your taste buds screaming for more. As you exhale, the sweetness balances out the sourness to bring you the best vaping experience you can possibly have. Pink Squares brings you the taste of your favorite pink strawberry candies that will have your sweet tooth nonexistent and your taste buds tingling in excitement. On the inhale of Pink Squares On Salt, the taste of perfectly made pink lemonade washes over your taste buds sending little shocks of happiness along the way. As you exhale, the taste of chew candy washes away any sourness. These tangy flavors will have you vaping this all day long. Candy King on Salt will become pod system users new favorite salt vape juice line. These salt nicotine vape juices will have you satisfied all day long, leaving you feeling as happy as can be with every single puff. 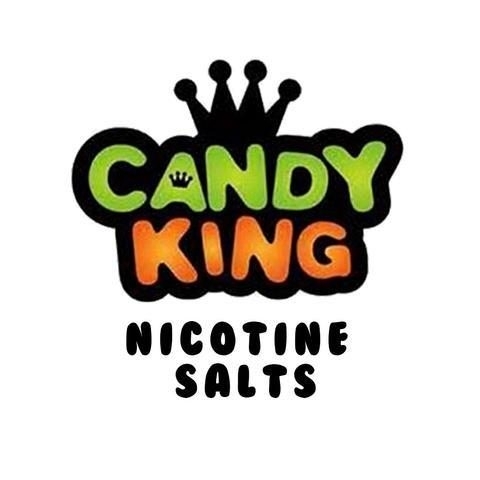 Candy King Salt Nic flavors are the perfect recreation of your favorite candy flavors in something you can indulge in every single moment of the day.